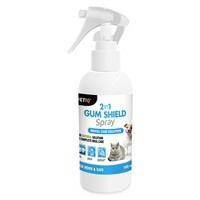 VetIQ 2in1 Gum Shield Spray contains a unique blend of Peppermint, Parsley Seed Oil and Pomegranate extract to help freshen your pet’s breath and promote a clean and healthy mouth. The advanced formula has been designed to reduce the amount of oral bacteria, while the presence of a special form of Vitamin C helps promote normal collagen formation in the gums; helping to maintain gum health, whilst also preventing the formation of plaque. VetIQ 2in1 Gum Shield Spray has a 360° spray nozzle to ensure total coverage inside the mouth, and has a low noise application so as to not frighten your pet.